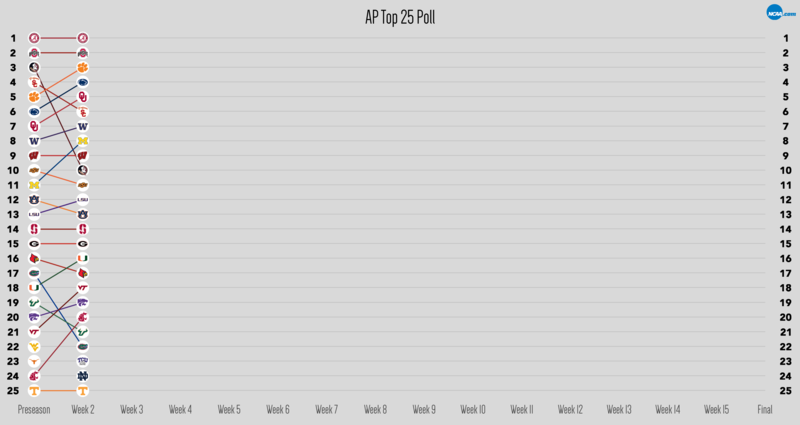 Michigan was the biggest winner of Week 1, rising three spots in the AP Top 25 to No. 8. The 2017 college football season is now officially underway, and the first AP Top 25 of the regular season is officially out. Last year, Alabama flatlined (in a good way) in the AP poll, staying motionless atop the rankings from the preseason to Week 15 as chaos unfurled below. Of course, Clemson had the last laugh, dethroning the Crimson Tide in the final rankings after its championship win. Alabama sits on top again as this season starts. But the season is young. What will happen in the next 14 weeks? 21-4 — Record for the ranked teams in Week 1. The Top 25 outscored its opponents by an average of 39-18. The biggest blowout was No. 14 Stanford’s 62-7 win over Rice in Australia, and the closest game was No. 25 Tennessee’s 42-41 win over Georgia Tech in double overtime. Eighteen ranked teams won their games by double digits, 13 won by three scores or more, and five (Wisconsin, Oklahoma, Penn State, Clemson, and Stanford) won by 49 points or more. Not a bad start. 7 — Number of conferences represented in the Week 2 poll (plus one independent). The SEC leads the way in sheer numbers with six teams, though the ACC is right behind with four. But by weighting the conferences according to their teams' rankings (i.e., No. 25 is worth 1, No. 1 is worth 25, etc. ), it's the Big Ten that comes out on top, thanks to four teams sitting in the Top 10. 4 — Number of teams that stayed stagnant. Alabama and Ohio State held their ground as No. 1 and No. 2 thanks to double-digit wins. The Crimson Tide knocked off No. 3 Florida State 24-7, and the Buckeyes overcame a strong start from Indiana to win 49-21. Lower in the rankings, No. 14 Stanford (which dismantled Rice by 55), and No. 15 Georgia (which took down Appalachian State 31-10 on the 10-year anniversary of the Mountaineers’ triumph over Michigan), stayed put in the middle of the pack. 12 — Number of spots teams from Florida fell in Week 2. Florida State lost to Alabama (dropping them from No. 3 to No. 10), while losing starting quarterback Deondre Francois for the season. Florida fell to No. 11 Michigan 33-17 (and from No. 17 to No. 22), and South Florida, though victorious over the FCS’ Stony Brook, dropped from No. 19 to No. 21. Miami was the lone school from the state to rise in the rankings, jumping from No. 18 to No. 16 after a 28-point win over the FCS’ Bethune-Cookman. 1 — Number of ranked teams that lost to unranked opponents. Of the four ranked teams that lost, three lost in ranked matchups. No. 3 Florida State dropped its primetime opener to No. 1 Alabama 24-7, No. 17 Florida fell to No. 11 Michigan 33-17, and No. 22 West Virginia lost 31-24 against No. 21 Virginia Tech. No. 23 Texas was the lone ranked team to fall to an unranked opponent, dropping a 51-41 contest to Maryland. 7 — The biggest drop in the rankings this week, courtesy of Florida State. 3 — The biggest jump in the rankings this week. Michigan rose to No. 8 from No. 11 after a comeback win against No. 17 Florida, and Virginia Tech slides up three spots to No. 18 after coming out on top against No. 22 West Virginia Sunday. 2 — Number of teams that fell out of the rankings. West Virginia and Texas became the first casualties of the season, falling from No. 22 and No. 23 in the preseason to unranked in Week 2. Don’t worry, Mountaineer and Longhorn fans. You’ll have plenty of company as the year goes on.